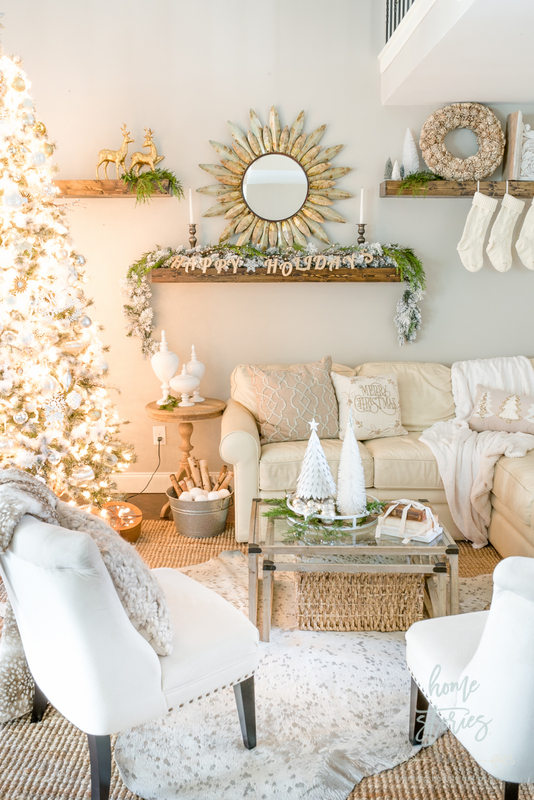 Beautifully and affordably decorated Christmas family room decorated in a rustic glam farmhouse motif, using finds from the Christmas Tree Shops. 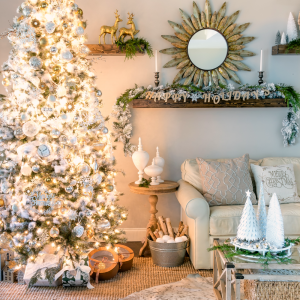 This post is created in partnership with Christmas Tree Shops and That!, a brand I love. All opinions on the cute and stylish decor are my own. 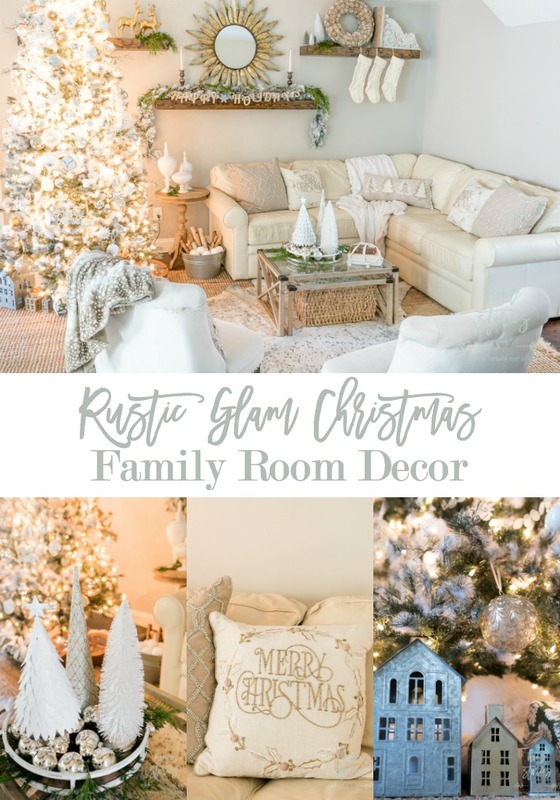 I have been an avid fan and frequent shopper of Christmas Tree Shops for the last decade and have talked about my affordable and adorable store finds on the blog over the years. However, this is my first time officially partnering with them, and I could not be more thrilled! If you’re not familiar with this store, then grab a warm beverage, perhaps a carbohydrate, and settle in for a treat! Christmas Tree Shops sells much more than Christmas decor. They offer an exciting, ever-changing seasonal assortment of affordable and stylish items for your home and life. I love to browse through their specialty foods, toys, beauty products, pet supplies, home decor, and furniture! If you don’t have a store in your area, don’t fret because you can shop for many of their products online. They are a treasure trove of affordable goodness. Let’s go shopping together and see what I found! I originally recorded and shared these video stories on my Instagram page. 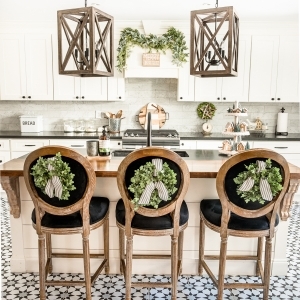 Click here to follow me on Instagram and watch my Instagram Stories for real-time updates and behind-the-scenes decorating tips! Sometimes it can be confusing to see a styled room and wonder which products came from where. I want you to know exactly which of my finds came from the Christmas Tree Shops! In the picture below, everything with a white tag on it was purchased in-store. In my video, I shared the store’s beautiful display of Christmas bulbs. I always enjoy treating myself to a few bulbs each year and love watching them grow. Look at this picture taken from the blog back in 2011 of their gorgeous paperwhites in bloom! 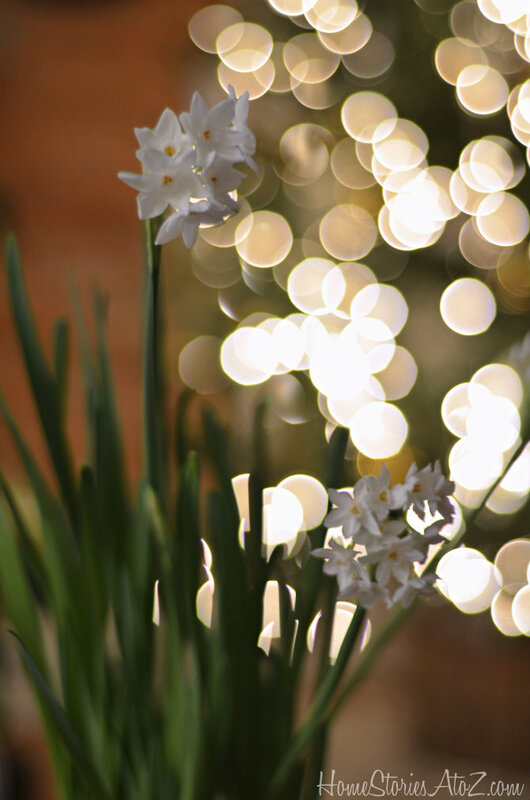 Forced paperwhites typically take between 4-6 weeks to bloom, so if you plant them now before Thanksgiving they should bloom in time for Christmas. If you didn’t get the memo, galvanized houses are all the thing again this year! 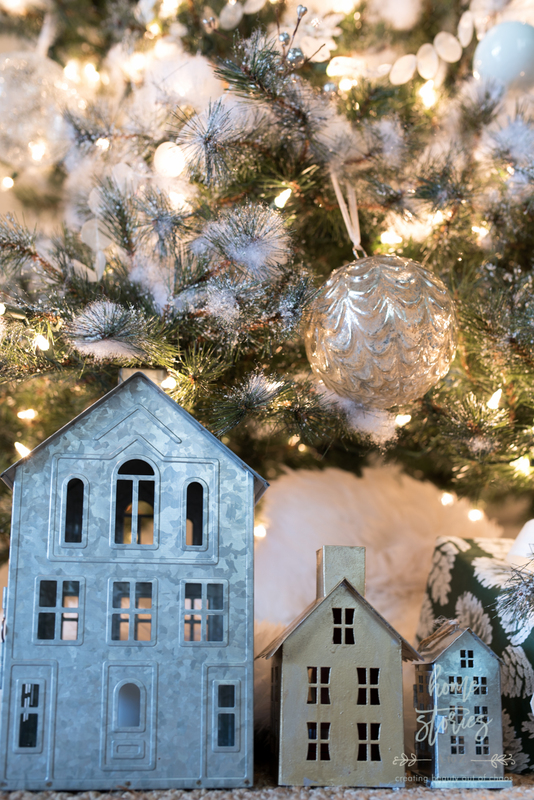 These mini-house ornaments light up when turned on and look adorable on the tree or styled in a vignette. 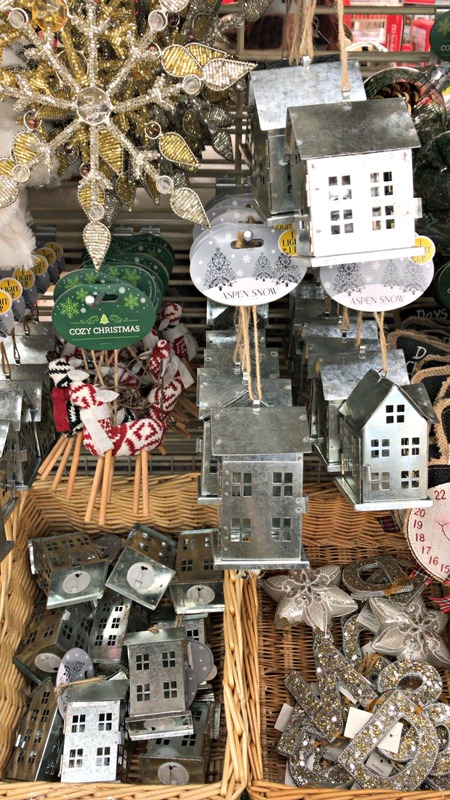 I bought two to go with my little galvanized village and displayed a few under the tree. Toss pillows and throw blankets are my love language. I probably own too many and yet somehow never enough! 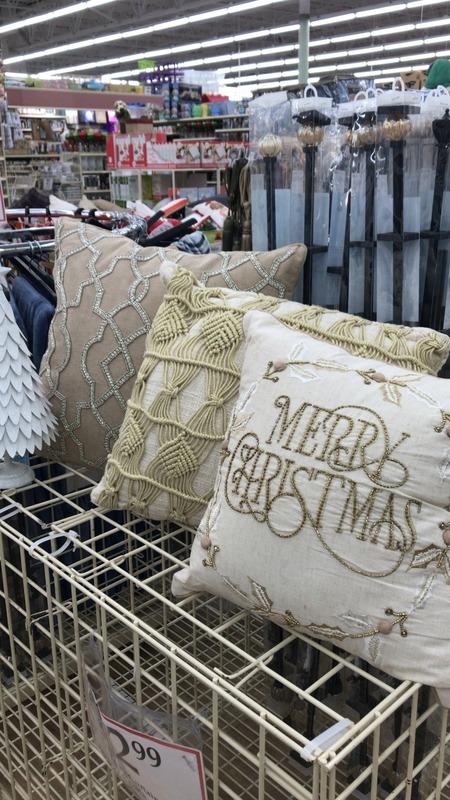 Christmas Tree Shops has a beautiful selection of both seasonal and non-seasonal pillows. 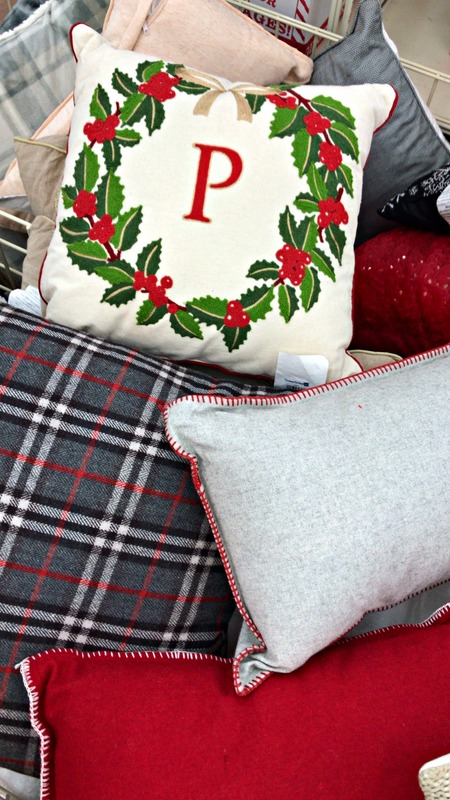 When I’m shopping for a room, I like to style the pillows in-store to get an idea of which direction I want to go in. 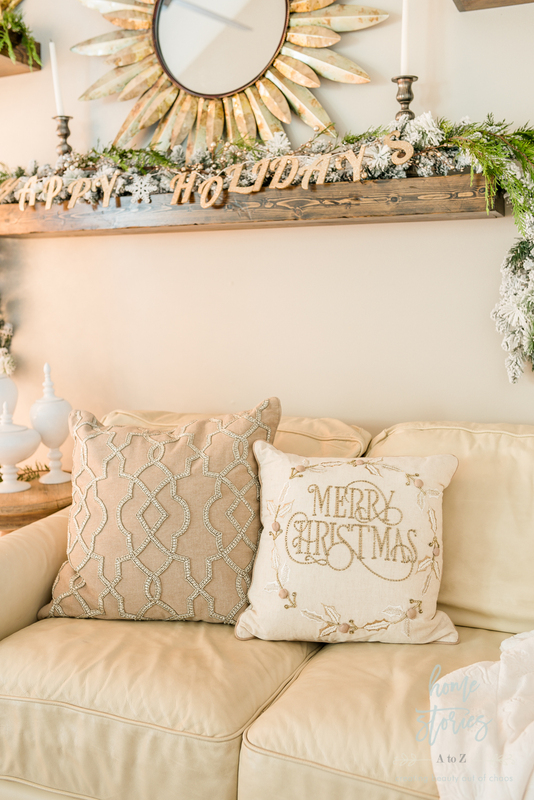 These silver and gold pillows were the inspiration behind my rustic glam Christmas theme for the family room! 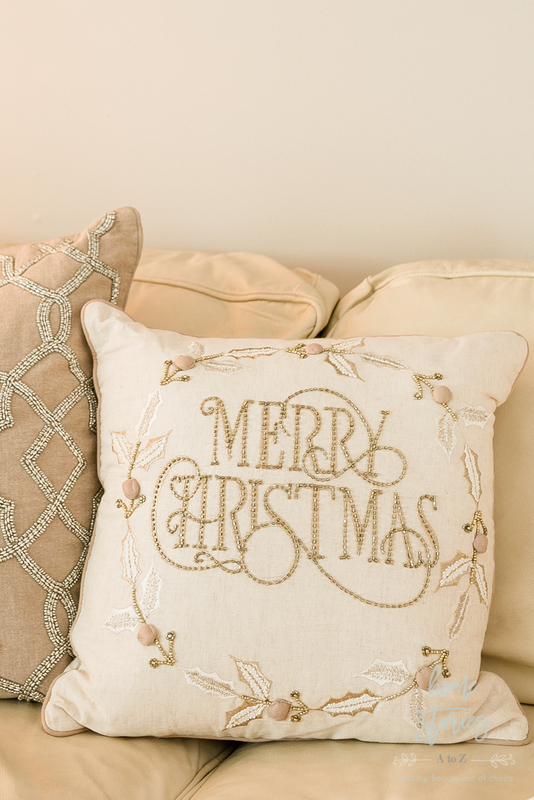 The beading on the pillows is so gorgeous and at $19.99 per pillow, quite a bargain! Here is a closer look at the beautiful beading! I love all of the stitching, texture, and details. 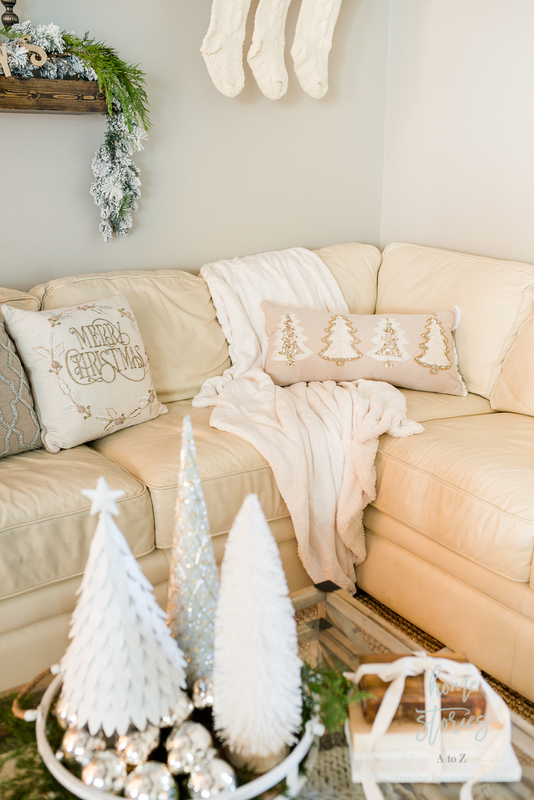 I also picked up this beautiful Christmas tree lumbar pillow and cozy sherpa throw! The sherpa throw was a fantastic buy at only $12.99. Our house gets chilly in the winter, so I like to keep a basket of throw blankets available in the family room for snuggling on the couch. The sherpa throw is ridiculously soft and has quickly become a fought-over kid favorite! It has a subtle snowflake and reindeer print and feels like it’s made from clouds and pegasus’ feathers. 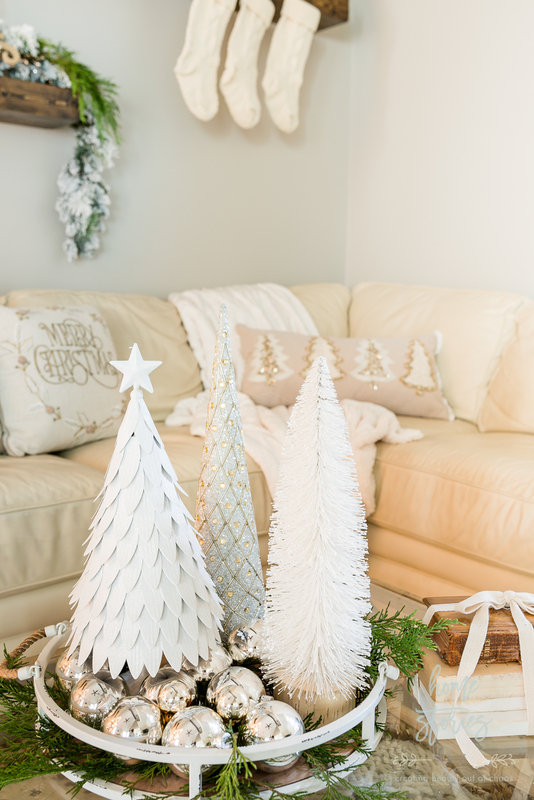 Once I settled on my rustic glam decor theme, I knew a sparkly mini-forest of trees for my coffee table would be perfect! Our store had a lot of mini trees to choose from. I was thrilled to find several options I liked and settled on this cute trio. Corralled in a tray, they add the perfect touch of sparkle to my coffee table and complement the rest of my decor! 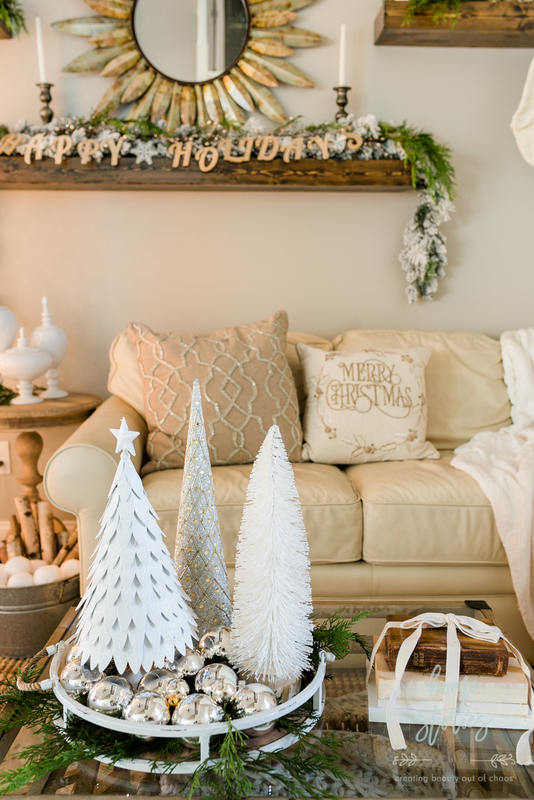 Thanks so much for stopping by today to tour our cozy and elegant Christmas family room! 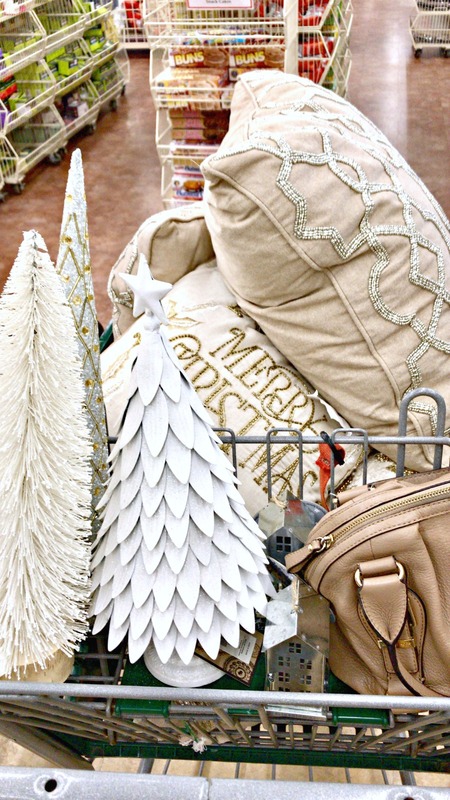 I hope you enjoyed seeing all the beautiful and affordable decor finds from Christmas Tree Shops. You can click here to browse their products online and see for yourself the incredible array of bargains waiting to be found! What a wonderful space you created! You have a great vision, creativity and skills. I really like the colors. 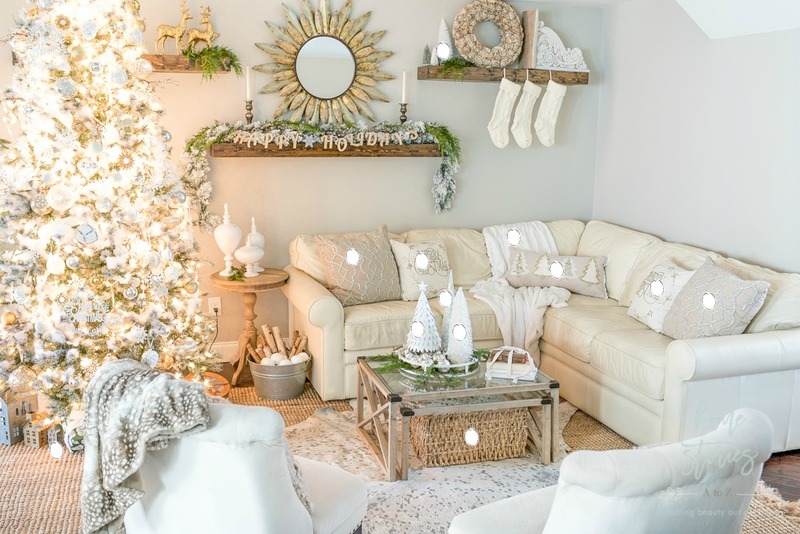 The illumination and the pillows match perfectly with the room! 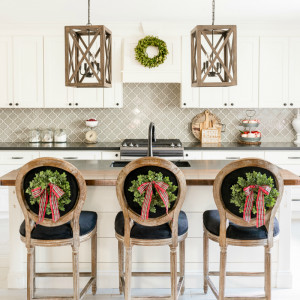 I’ve been looking for the right holiday decor for my home’s style and found a couple interesting holiday decor styles here: But I love the Rustic Glam that you created. Absolutely gorgeous. I had never heard of Christmas Tree Shop before. Sharing!!! 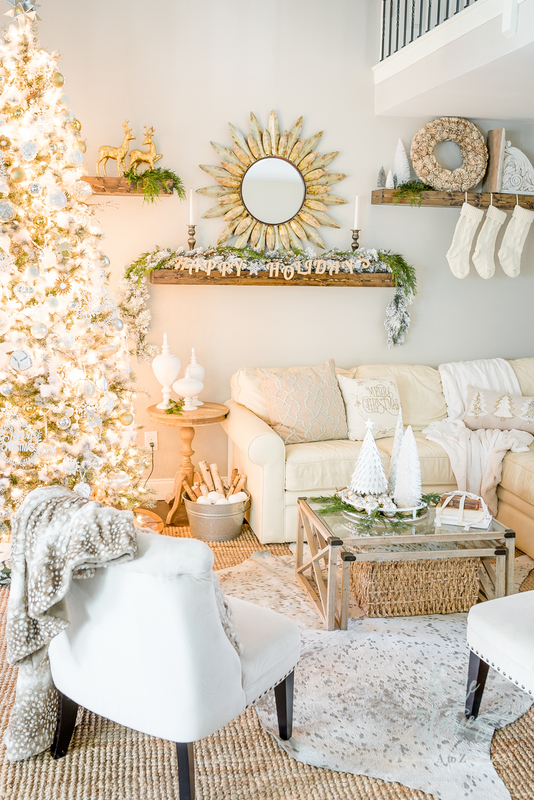 Beautiful room and tree and really fantastic finds at the Christmas Tree Shop. Love all of those pillows . Thanks Marty! Their selection is always fabulous and I agree! The toss pillows are amazing.